Although I’m not the infomercial type, and I ‘m slightly embarrassed to admit it, I’ve been dying for a Yonana’s machine for months! I was a little skeptical that this $50 product from a late night infomercial could turn frozen fruit into frozen yogurt in mere minutes,I mean really. My skepticism was quickly shot down after my sweet mother-in-law gave me one for Christmas. The Boyds now have a healthy alternative to our usual Sweet Cece’s run (and trust me,we go a lot. To make a sweet treat, all you have to do is toss bananas, fruit, nuts, chocolate, etc. into the machine, and let Yonanas do the work. This is a cheap and healthy way to keep your sweet tooth satisfied without feeling guilty about it later. 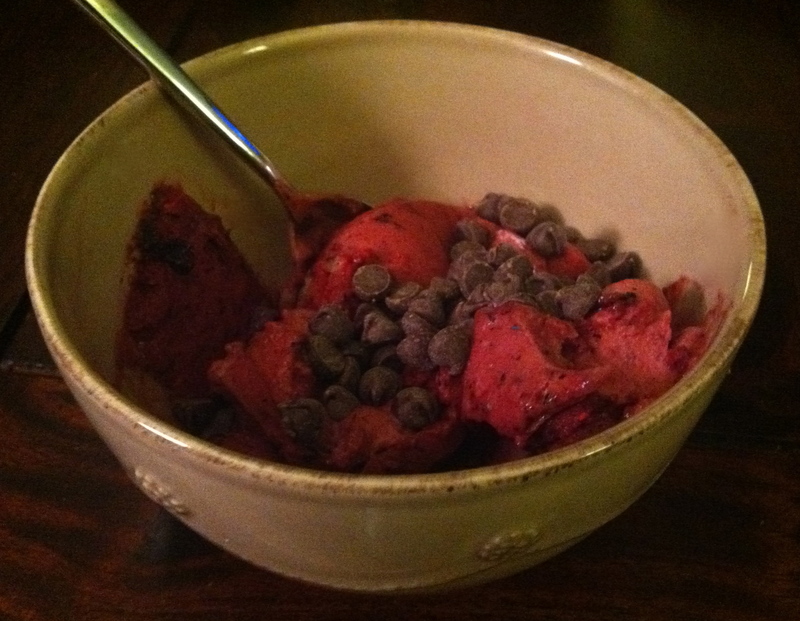 My latest Yonanas treat containing frozen strawberries, raspberries, blueberries, and blackberries topped with dark chocolate chips. When using bananas, the texture turns out to be just like frozen yogurt, and when using other frozen fruits, the texture turns out more like a sorbet. No matter what fruit you use, it turns out super rich (dense) and is very filling. The bowl above was way too big of a serving for me to actually finish. Deal Seekers: Bed Bath and Beyond sells Yonana machines for $49.99. Use one of their 20% off coupons to make your total cost (before tax) only $40.00!